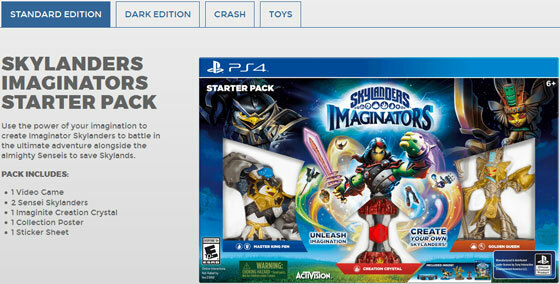 Following on from a couple of Singapore based retailers listing a PS4 exclusive "Crash Edition" of Skylanders Imaginators, the official website has perhaps inadvertently confirmed that something with that name is indeed coming. Nothing beyond the word "Crash" is mentioned as the tab does nothing when clicked on but it certainly backs up what those retailers had listed. With E3 2016 next week the contents of this "Crash" bundle will hopefully not remain a mystery for too much longer. 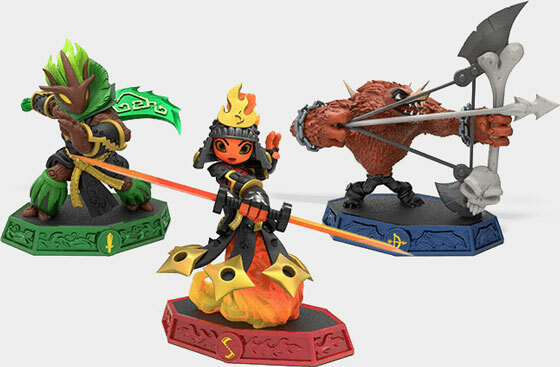 The sixth game in the Skylanders series has been announced as Skylanders Imaginators. 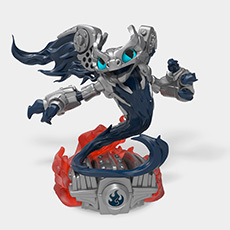 The core idea behind this edition of the game is the creation of your own custom Skylanders, there are also going to be 20 brand new "Sensei" Skylanders as well as 11 former Villains turned Skylander. 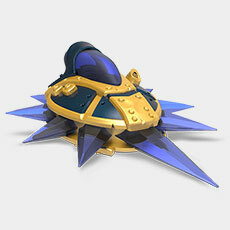 To create one of these "Imaginators" (an example above) you'll first need a Creation Crystal, you get a Fire element one in this year's Starter Pack, once you have that you can choose a class of fighter (10 to choose from including Sorcerer, Brawler, Ninja, etc.) 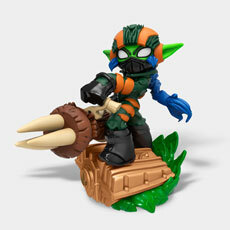 and then mix and match through thousands of different combinations of heads, arms, torsos, legs, voices, weapons, and colour schemes to create a Skylander of your very own. The Creation Crystals will cost $9.99 each. 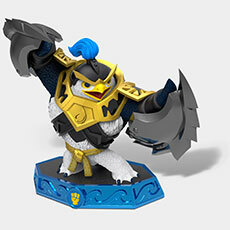 In addition to the custom Skylanders there will be new Sensei characters that will help improve your creations by unlocking things like special moves and allowing your creations to grow to higher levels. 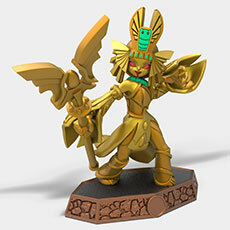 The Senseis are joined by a selection of reformed Villains, like Golden Queen, this time as fully fleshed out playable Skylanders complete with their own physical toy. These figures will cost $14.99 each. The game will be releasing on PS3, PS4, Xbox 360, Xbox One, and Wii U in October, on the 16th in North America, the 14th in Europe, and the 13th in Australia/New Zealand. There will not be a Wii, 3DS or even an iOS version of the game this time around. 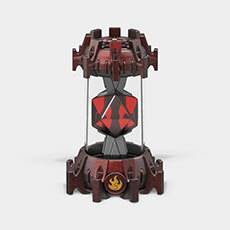 The regular version will cost $74.99 while the new Dark Edition will be $99.99. 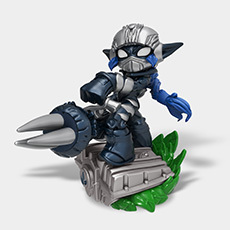 Jumping the gun a little, Toys R Us have included something called "Skylanders Imaginators" in the Character/Theme category for searching on their website. The category is completely empty when clicked on but this would seem to be the title for the next Skylanders game. 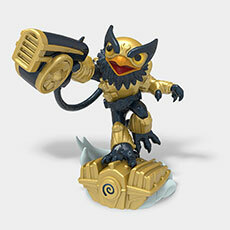 Today marks the official release of Skylanders Battlecast in the US and Canada. 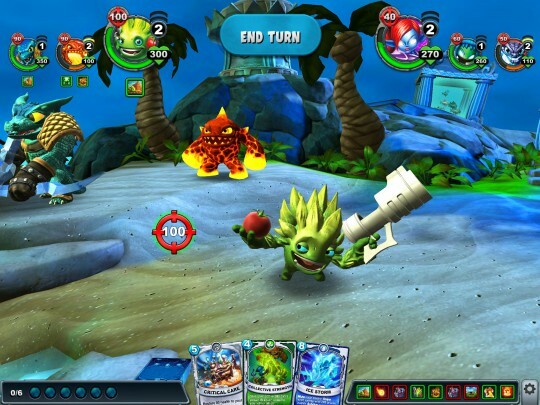 The mobile collectible card game launched earlier in the year in a few countries but this week sees many more countries added and an update to the game that brings in the final boss. 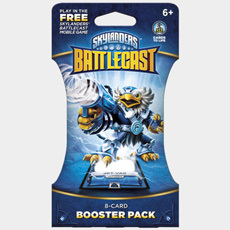 To collect cards you can either purchase the Battle Packs and Booster Packs physically in stores ($9.99 and $4.99) or you can purchase them digitally from within the game itself. In game you can earn coins to buy those packs by completing quests and missions or you can just choose to directly purchase coins with real money. 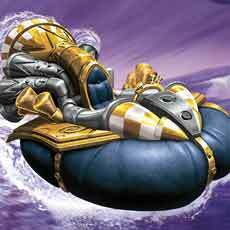 There are also free cards given away daily to help bolster your collection. 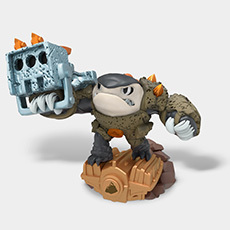 The most recent update to the game has also finally added in the ability to add friends in order to battle them directly, so get on over to our Skylanders Battlecast board to join in. You can find the free download of the game on the App Store, Google Play, and the Amazon Appstore. 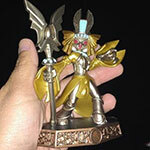 Forum member skylandsfan has spotted the first new Skylander from the next game. 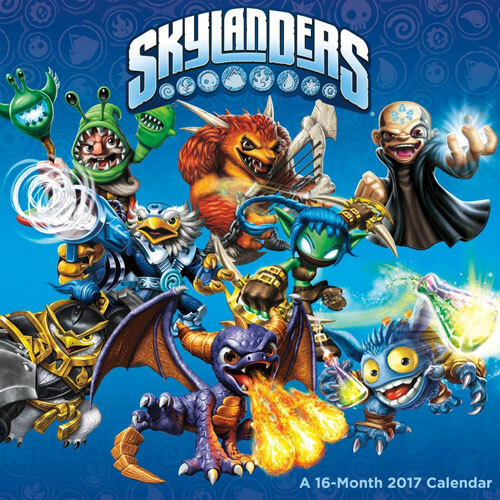 Found on the cover of an officially licensed calendar we can tell that this new penguin-esque Skylander is part of the water element but if it's also a new type of toy it is not immediately obvious what that new function could be. 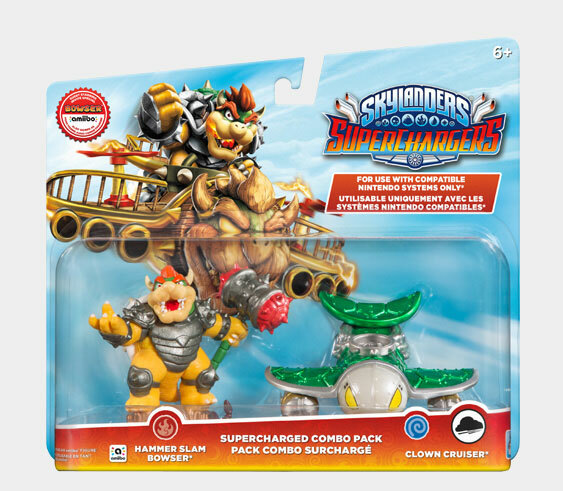 Skylanders SuperChargers was officially announced on the 3rd of June 2015 so even though announcements have been getting later and later each time hopefully it won't be too much longer before this year's instalment is unveiled. 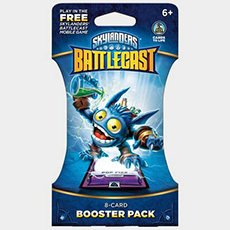 Skylanders Battlecast, the mobile trading card game first announced back in August last year, today added Australia to the small selection of countries it is officially available in. If you're living in Australia or New Zealand you should now be able to find the physical cards in stores and the free app on the App Store, Google Play, and the Amazon appstore. I would definitely recommend making sure your mobile device can actually run the game before diving headfirst into piles of booster packs. 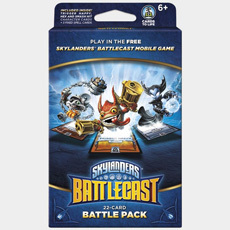 Based on Activision's award-winning Skylanders franchise, Skylanders Battlecast is a new, free-to-play mobile card game where players build their ultimate deck of cards, master strategic card combinations and use them in never before seen battles! 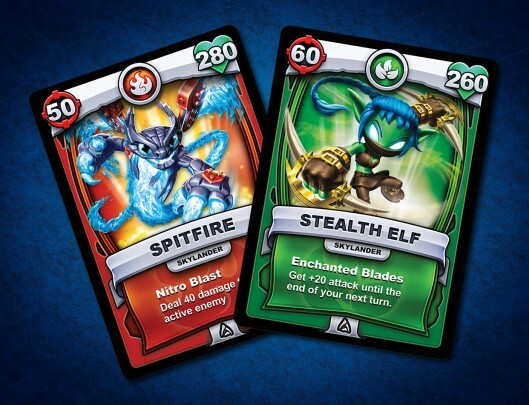 Starting today, players in Australia and New Zealand can head to retail stores to purchase physical card packs to begin their epic journey to become a champion of Skylands. For the past few months the app has been in a soft launch with the developers still actively adding new content, for example just this past Wednesday they completely overhauled how you progress through the story missions and added even more ways to earn new cards. The game isn't quite 100% complete just yet but it is certainly shaping up well. 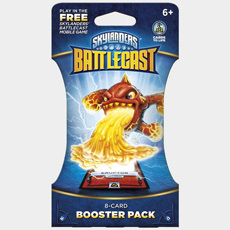 Activision assembled a team of experts across video game design, physical card game design, pro card players and top card artists to develop Skylanders Battlecast. 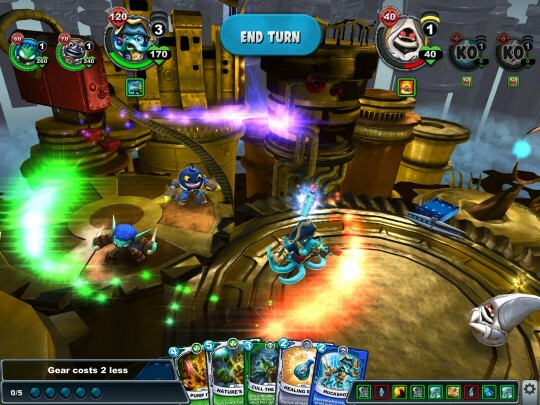 Unlike traditional trading card and mobile battle games, Skylanders Battlecast offer fans impressive graphical fidelity in the form of a 3D-rendered gameplay experience that is incredibly fun and highly strategic. 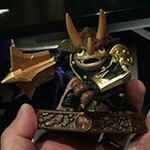 If the dates provided by various different international distributors are correct at the latest we should see Skylanders Battlecast getting its full release in North America and Europe by the end of May. To talk with others playing, make sure to check out our message board for the game. 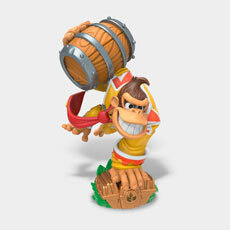 Despite the initial claims that the Nintendo characters would be exclusive to the starter packs they are now releasing Combo Packs for Turbo Charge Donkey Kong and his Barrel Blaster, and Hammer Slam Bowser and his Clown Cruiser. Reports have already been coming in of people finding them in the wild. 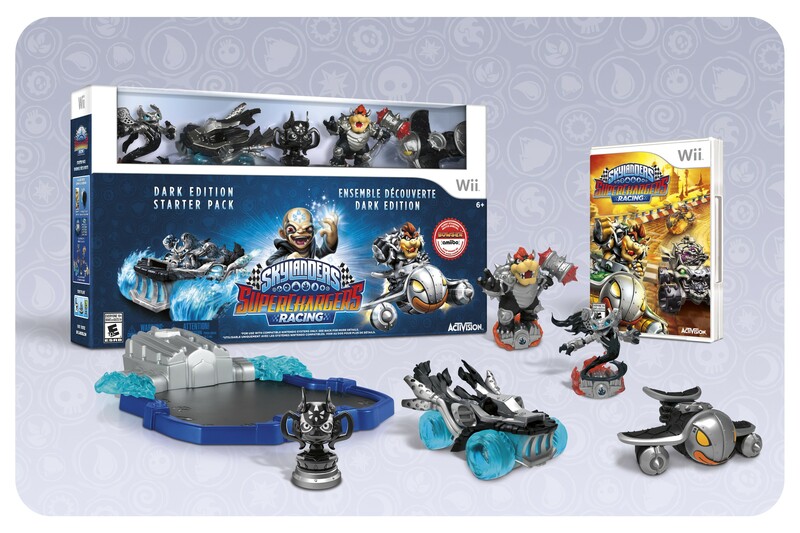 Don't forget that these figures and vehicles will only work on the Wii U, Wii, and the 3DS. 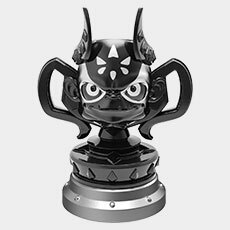 For those of you who skipped the Dark Editions you may be interested to hear that GameStop is going to be the exclusive home to a single pack of the Kaos Trophy which they're selling for $7.99. 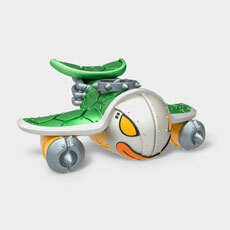 The Kaos Trophy simply allows you to race as Kaos during Sky races, it does not unlock any other extra content. 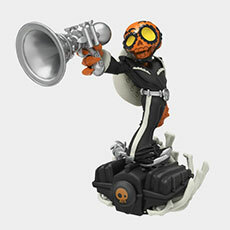 And finally, other reports are coming in for findings (or soon to be releases) of a whole host of new Alter Egos including Legendary Bone Bash Roller Brawl, Nitro Soda Skimmer, and Birthday Bash Big Bubble Pop Fizz. 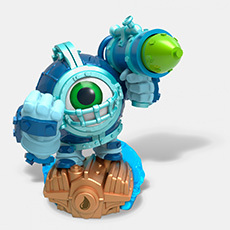 Extra Life 2015 - mini KABOOM! 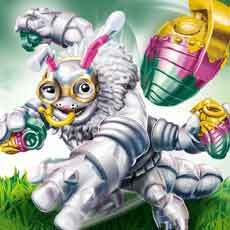 This weekend the folks over at mini KABOOM! are going to be participating in Extra Life 2015 to support Children's Miracle Network Hospitals. They'll be streaming a lot over the weekend on their Twitch (http://twitch.tv/minikaboom) with it all kicking off a little bit later on today at around 7PM EST. 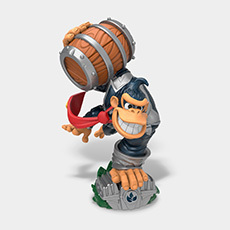 In addition to Skylanders they'll be playing games like Disney Infinity 3.0, Splatoon, and Mario Kart and they will be giving away tons of Skylanders toys across the weekend, so make sure to check them out and donate if you can! Well, everyone, it's that time of year again! As we did last year, we at mini KABOOM! are participating in the annual Extra Life fundraising event to raise money for sick kids benefited by the Children's Miracle Network. Beginning this evening, November 6th, 2015, at around 7:00 PM EST US, we and our families will begin live streaming various games, chatting, giving away prizes and in general, having a good time. This year, instead of streaming for 24 consecutive hours as we did previously, we will be streaming as much as possible across three days, Friday 11/6, Saturday 11/7 and Sunday 11/8. We will begin streaming this evening around 7:00 PM EST US and around 9:00 AM EST US on Saturday and Sunday; we will be streaming live throughout each day until the point where we're too tired to go on and will "log off" for a few hours overnight, during which the chat room will remain open and we will stream past episodes of our podcast, Skycast: The Unofficial Skylanders Podcast. We will be playing various family friendly/appropriate games across multiple platforms and invite any/all to join us when possible! 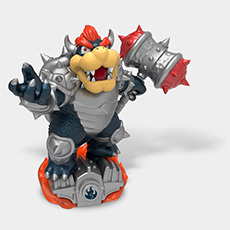 There are plans for lots of Skylanders but also instances of Disney Infinity 3.0, Splatoon, Mario Kart and others! Once the kids head to bed this evening, Matt and I plan to stream Destiny together for a while and invite anyone who wants to join our fireteam to do so! If there are any games that we haven't specifically mentioned, please feel free to bring them up and if we have them available we'll see if we can get them into rotation. In the past we've streamed Minecraft for the PC and PS4 and are still up for some group builds if there is demaned for it. In regard to the prizes, we have so much stuff to give away this year that we'll likely need to get something out the door approximately every 30 minutes in order to be able to give it all away! 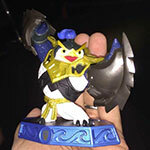 We have a ton of Skylanders stuff (well, maybe 100lbs) to give away including (but not nearly limited to) two individually packaged Dark element traps, Swap Force and Giants starters for various systems and a Trap Team starter for PS4, two copies of SuperChargers (Wii U & PS4, game & portal only), Punk Shock (standard packaging), Echo, all three Spring Edition minis/traps from earlier this year and more! 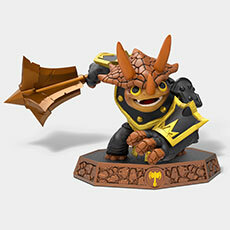 As a grand prize, we are giving away an incredible painting of Terrafin by jurassicskylander! This will be available to donators only, with one chance to win given for every $5 donated. 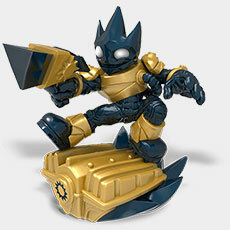 All donators, no matter the amount, will receive a mini KABOOM! wrist band! You can check out all the details as well as see a photo of the incredible painting mentioned above at http://minikaboom.com/extra-life/. From there you can see the current list of prizes, what we've raised so far as well as any updates to our streaming schedule that may occur. So, what can you do to help? If possible, please donate what you can as 100% of donations go to Children's Miracle Network to help sick kids. If you can't donate, we understand. Instead, come hang out with us and help us and others have a great time! Even if you just idle in our channel during the stream, you help drive up our number of viewers which makes us more visible overall on Twitch and helps to bring in donations. We'll be playing a lot of games over multiple days and aim to have a great time this weekend! Thanks for reading this far and potentially, for any donation(s) you've made. You can check out our live stream starting tonight at around 7:00 PM EST US at http://twitch.tv/minikaboom. If you sign up for a Twitch account, you'll be able to follow us and receive an email notification once we start streaming. You can also follow us on Twitter at @mini_kaboom & @megacollector or on Facebook & Google Plus under Mini Kaboom; as soon as we begin streaming, we'll be sending out notices on all services, so if you're subscribed/following, you should know right after everything starts! Thanks again for reading through this as well as any support you can offer. Looking forward to seeing you this weekend! 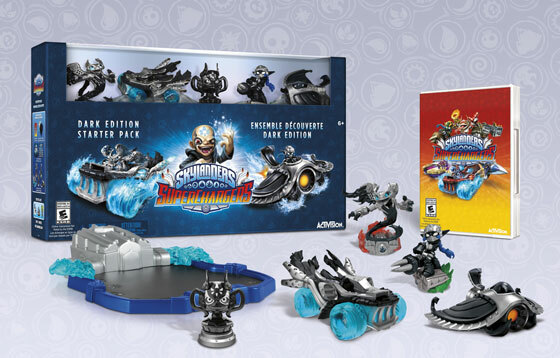 We're at that point again, today is the North American launch day for Skylanders SuperChargers and the reviews are starting to roll in so it's time for the annual review roundup. The reviews published so far seem fairly positive and pretty consistent with the reviews given for Trap Team last year, although of course not without exception. 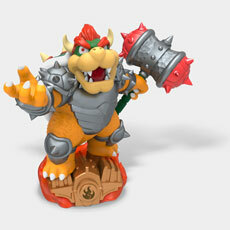 Skylanders: SuperChargers is just bursting with content, and fortunately, all of it is great fun. If you’re invested in the series, SuperChargers is on par, if not better, than the best the series has offered in the past. Getting into a vehicle and changing the gameplay up, say mid-level or for a boss fight, is vastly more engaging than the typical elemental change. But it's really just the beginning. The levels play with gravity, with humor, with painterly backdrops and size. There are even clever tweaks at some of gaming's tropes. Just when you think you've seen it all, you find yourself sitting back down to do something new and spectacular. And all of these activities benefit from the sort of sheen we’d expect of an entry in a yearly franchise that has been polishing its formula for half a decade. The controls are tight, the visual presentation is terrific. 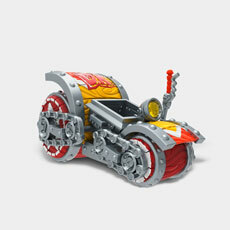 Upgradeable and customizable, the vehicles in Superchargers are much more than gimmicks. 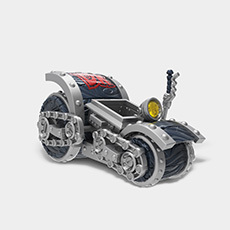 They are characters in their own right, only much more important—the entire level structure of the game has been transformed to accommodate these wicked rides. Being someone that has played the games, but not to completion in the past, I found myself more immersed in the world this time around and I think the variety is the reason. 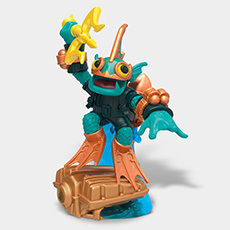 While the vehicles adds the most visible "new" element to Skylanders, there's plenty more here that expand upon the series' traditional action adventure (with a little puzzle solving) formula. 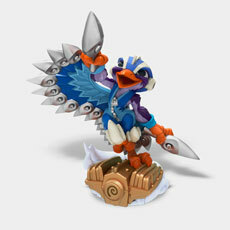 Nearly every level and area you'll explore in Skylanders comes with a unique gameplay twist. 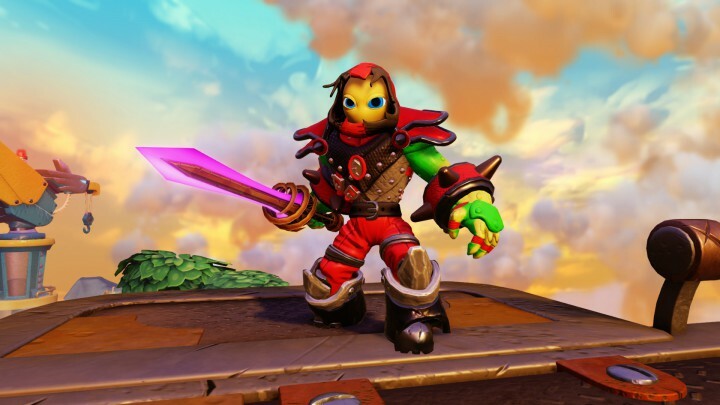 Activision and Vicarious Visions have seemingly done the impossible by keeping Skylanders fresh for its fifth outing. 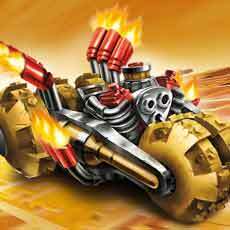 SuperChargers is jam-packed with enough content to fill at least two separate games and it’s all quality stuff. By the third level, I would grimace whenever I saw an icon telling me I needed to place a car on the Portal of Power for a vehicle sequence. The cars are the weakest part of the campaign, and most are tied to the critical path. I'll be updating this news post with more reviews as they appear. For other territories the game launches in just a few days on the 23rd for Australia and the 25th for Europe. 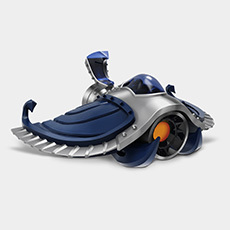 To mark the launch of Disney Infinity 3.0 the official Skylanders website has been updated with new images for the many of the new Skylanders and Vehicles from Skylanders Superchargers. 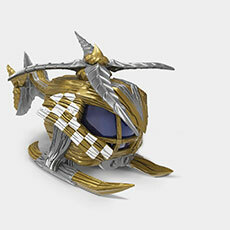 Thanks to several inquisitive forum members we also have images for several new alt decos that we had previously not seen before and a name for Trigger Happy's vehicle: Gold Rusher. 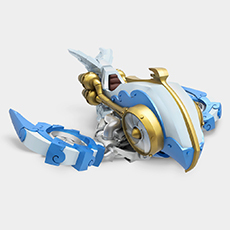 Astroblast and Sun Runner's Legendary status confirms that there will be a Legendary version of the Sky Racing Action Pack, the regular version of which is scheduled for launch in Wave 3. This weekend also saw a playable demo of the 3DS version of the game at PAX Prime giving us our first proper look at how it plays. Still no sign of the Wii or iOS versions. 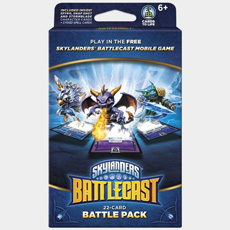 The mystery of the missing cards has been solved with the announcement of Skylanders Battlecast, a brand new card battling game for mobile devices that can make use of digital cards you can buy in-game and physical cards that you can purchase at retail. The game is due out sometime in 2016 and will be available for "free" from the App Store, Google Play, and the Amazon Appstore. Pricing for the cards has not been revealed. 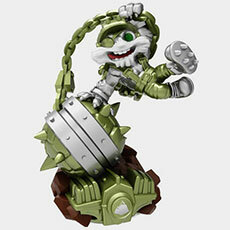 As retailers are beginning to list pre-orders for the figures so too are they posting pre-orders for their exclusive alternate versions of characters. The first two that have been sighted are Fiesta and Smash Hit. 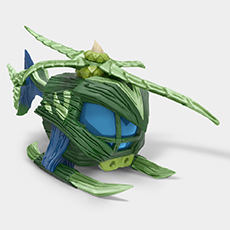 There have also been mentions of a few other variants but no images have been found for them just yet. In other news, the complete Achievement list for the game has been revealed by XboxAchievements, obviously if you wish to avoid spoilers for the story then it's probably not all that wise to read them. In what is a quite sensible move, despite the existence of the recently shown off online mode none of the achievements appear to be related of it (although you can perhaps earn the single co-op achievement using the brand new online co-op mode). I posted this in the forums just over a week ago but there's not been much other news lately so here it is now on the front page as we continue the wait for gamescom next week (August 5th-9th) and its potential for new information. 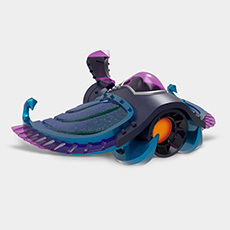 Combining a few European retailer listings I have managed to put together what looks to be the lineup of toys for the first few SuperChargers waves (aside from any retailer exclusive alt decos). But what are these Triple Packs for? Can they save you money? 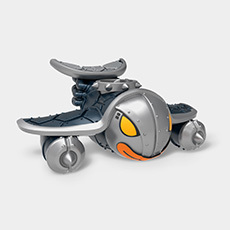 Well... yes, it seems that they can do that (obviously only if you were planning on getting all of the included toys already). 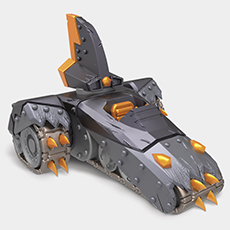 At the prices they were listed at you could buy the triple Terrafin+Shark Tank+Jet-Stream and a single Jet-Vac for less than if you bought them in the two Combo Packs (€30+€13 vs. €25+€25). Dates attached to the listings imply that Waves 1 and 2 will be released at launch with Wave 3 following approximately two months later. As with the prices these are dates for the European markets so the situation may be slightly different in the US. 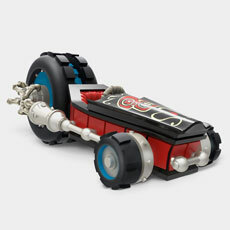 And if you don't already then make sure to check out the awesome mini KABOOM! Skycast, a dedicated weekly Skylanders podcast which is this week celebrating its 25th episode and announcing the winner of their E3 Hot Streak giveaway. 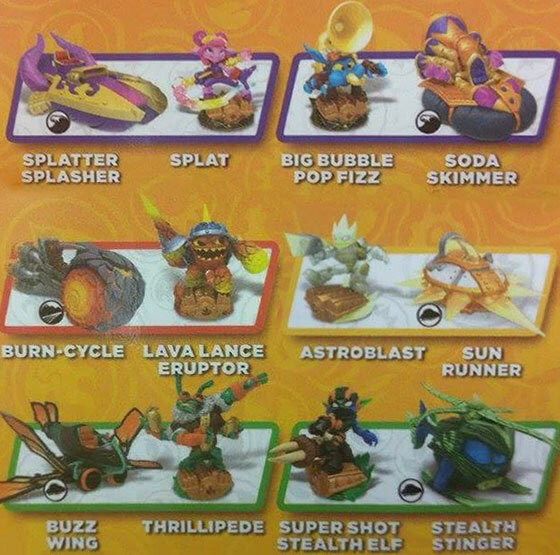 Earlier today Instagram user ziotec took some photos of the back of a Skylanders SuperChargers pre-order display box which shows off several new Skylanders and vehicles. 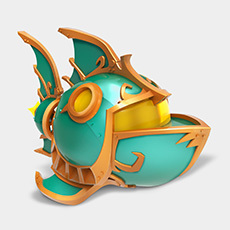 So we now know of the new Life SuperCharger "Thrillipede", the returning Magic SuperCharger "Big Bubble Pop Fizz", and the new Light SuperCharger "Astroblast". 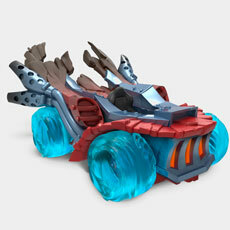 There are some new vehicles with Pop Fizz's vehicle "Soda Skimmer", Thrillipede's vehicle "Buzz Wing", and Astroblast's vehicle "Sun Runner". 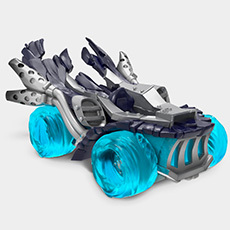 And we have names for Splat's vehicle "Splatter Splasher", Lava Lance Eruptor's vehicle "Burn-Cycle", and Stealth Elf's vehicle "Stealth Stinger". 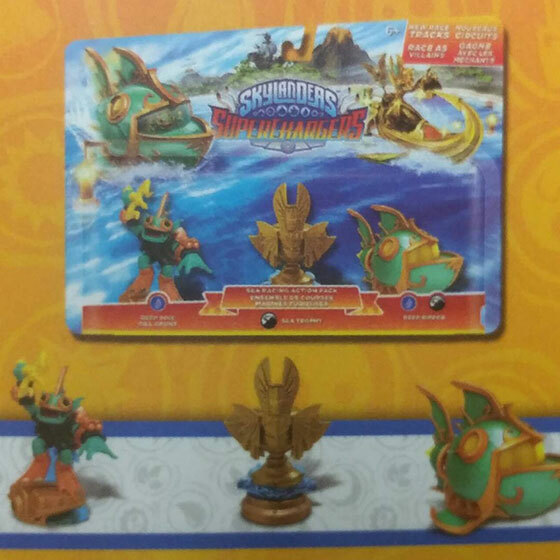 On the side of the box there is also confirmation of "Racing Action Packs", the example of which contains Deep Dive Gill Grunt, Reef Ripper, and a Sea Trophy shaped like Golden Queen's head. 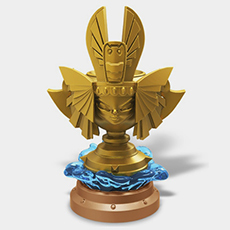 It is likely of a similar function to the Kaos Trophy that comes with the Dark Edition Starter Pack, but we still don't really know what that does yet either. 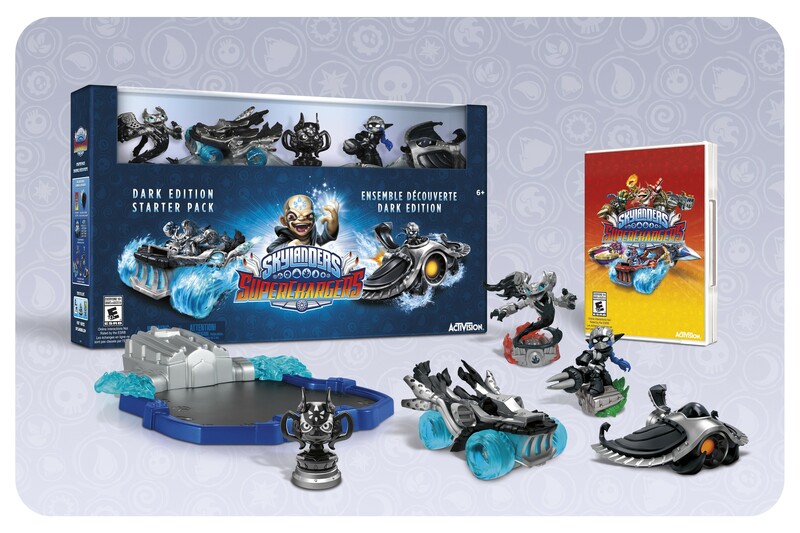 The top corner of the pack does however mention "New Race Tracks" and "Race As Villains" so make of that what you will. 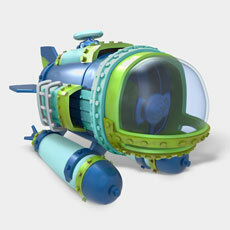 Also worth noting is that in a list of features the box mentions "NEW Online Multiplayer Race & Coop Modes". 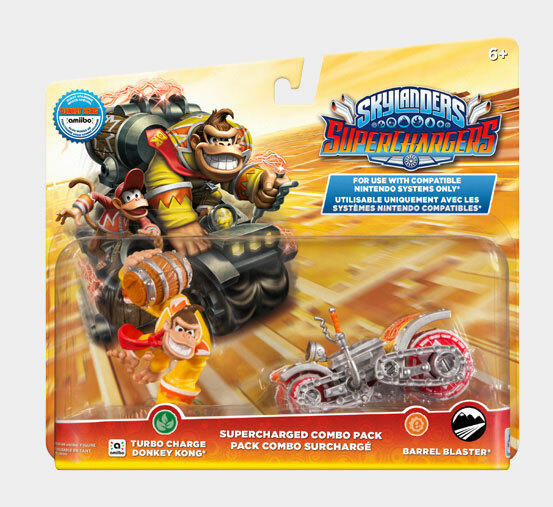 I am sure it's not out of the realms of possibility that there will also be a Racing Action Pack and Combo Packs available at launch in September. 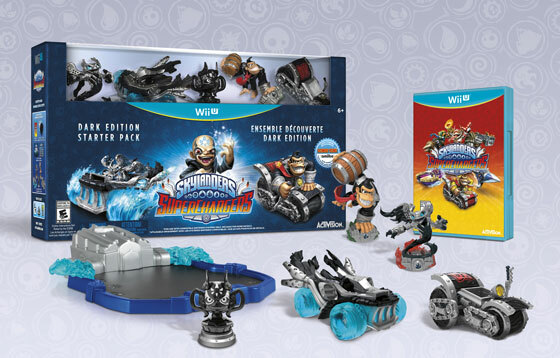 The Dark Editions for Skylanders SuperChargers have been revealed. 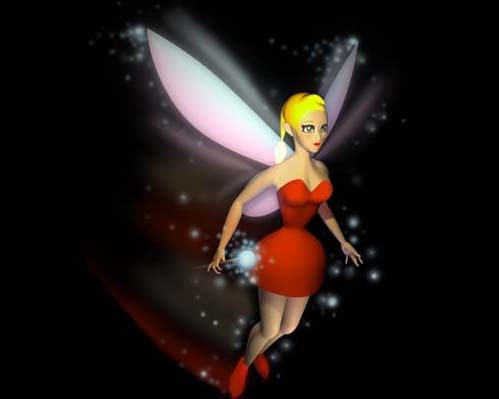 The PS4/PS3/Xbox One/Xbox 360 versions will contain Dark Spitfire, Dark Super Shot Stealth Elf, Dark Hot Streak, Dark Sea Shadow and a Kaos Trophy that can be used to unlock "special Kaos gameplay content". It'll cost you $99.99 for the Dark Edition. 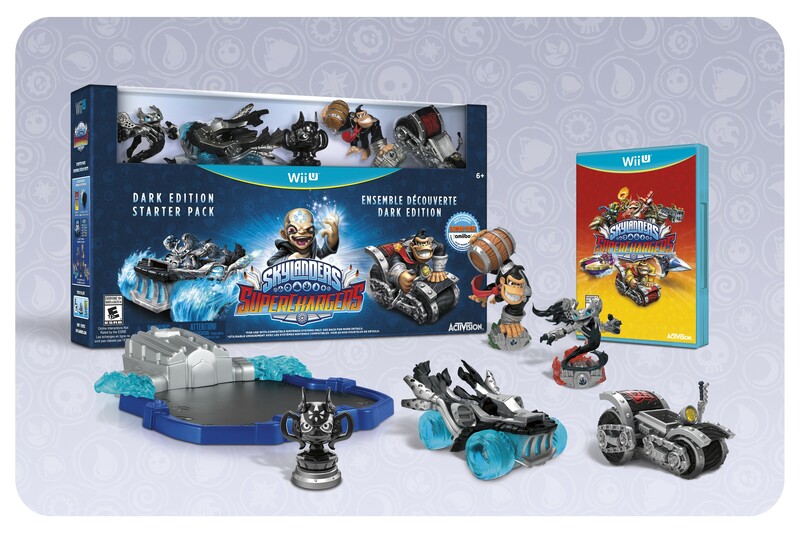 The Wii U edition will have Dark Spitfire, Dark Hot Streak, Dark Turbo Charge Donkey Kong, Dark Barrel Blaster and the Kaos Trophy. 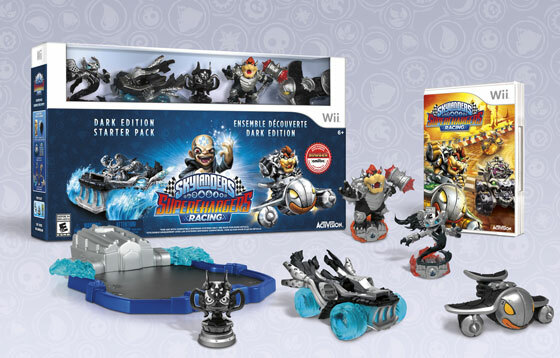 The Wii edition will have Dark Spitfire, Dark Hot Streak, Dark Hammer Slam Bowser, Dark Clown Cruiser and the Kaos Trophy. 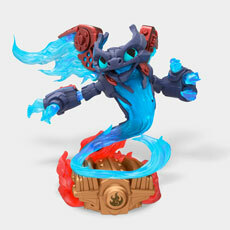 Also revealed are several new entries to the Eon's Elite line of figures. 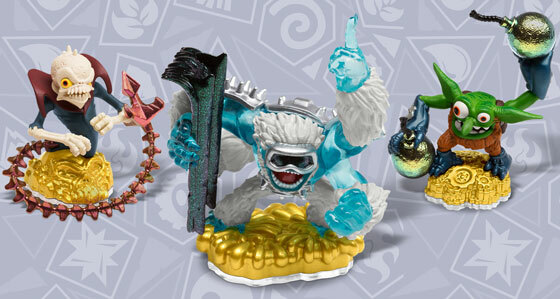 The first wave of them will be available exclusively at Toys R Us in November and is made up of Slam Bam, Zook and Voodood. 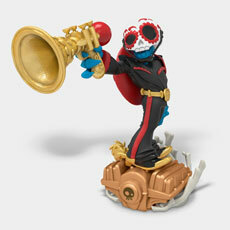 A second wave with Ghost Roaster, Boomer and Dino-Rang will be released in December. 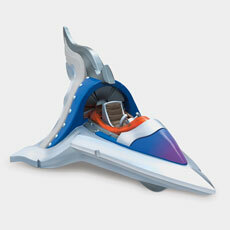 Check out a load of screenshots and artwork in the SuperChargers Gallery.